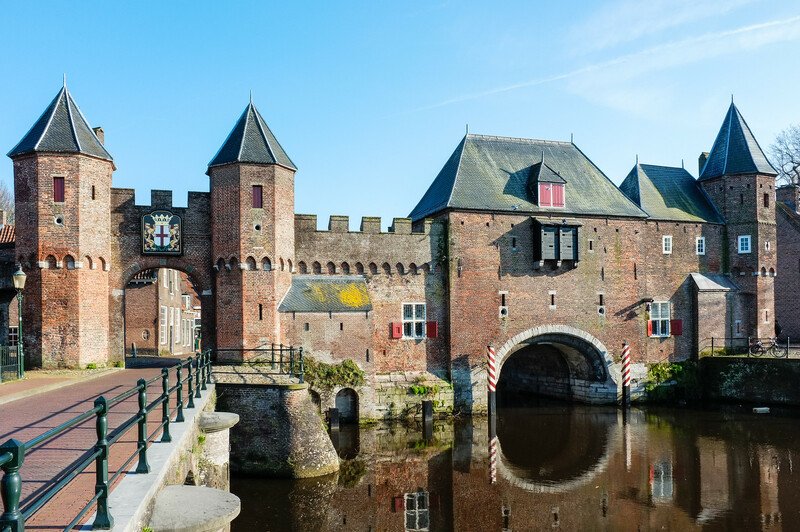 The Koppelpoort is a medieval gate in the Dutch city of Amersfoort, province of Utrecht. 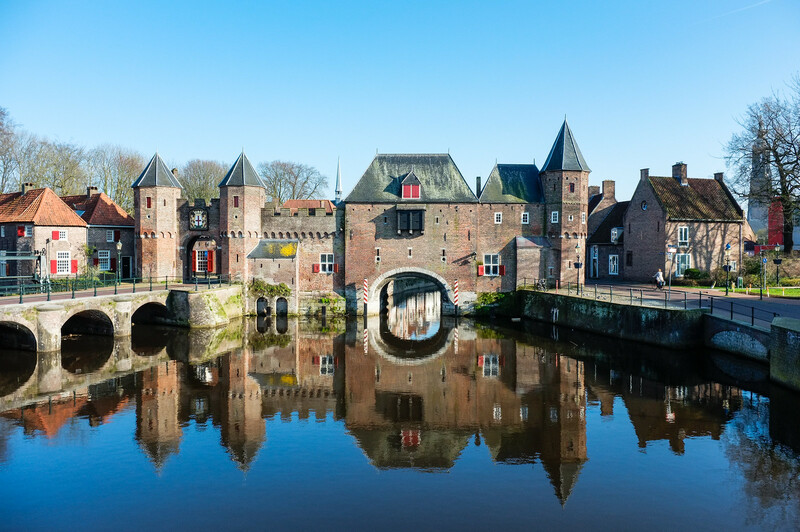 Completed around 1425, it combines land and water-gates, and is part of the second city wall of Amersfoort, which was constructed between 1380 and 1450. The gate was built between 1380 and 1425 as part of the second city wall. The whole wall was completed around 1450. The gate was attacked in 1427 during the siege of the city. This attack was repelled. The gate was opened and closed every day by the appointed raddraaiers, "wheel-turners". A minimum of twelve wheel-turners were collected morning and evening by several guards. It was an extremely dangerous task; if they did not begin walking simultaneously, then one could fall, dragging the rest along with often fatal results. Before the gate could come down, it had to be raised, to pull out the iron pins that held it in place. Only then could it come down. While the gate was going down, walking in the wheel grew ever easier and faster, and many people stumbled and broke their limbs. The koppelpoort was also never breached. The Koppelpoort was given its current appearance during the restoration by Pierre Cuypers in 1885 and 1886. Among other things, Cuypers removed a step between the two gates and replaced it with a slope. From 1969 to 1993 a puppet theater was situated in the gate. The latest restoration was completed in 1996. It was carried out very cautiously, and with respect for the old building materials. For this the town of Amersfoort received the Europa Nostra Award. Thanks Armando for watching and commenting. Most of the times Friday is my day off and when the weather is ok I visit interesting Dutch cities. Last Friday I went to Kampen, located on a peninsula near the river IJssel and lake IJsselmeer. Kampen is an excellent example of a small Dutch city with a nice historic (medieval) city centre. The inhabitants of Kampen are rightly proud of their city. They were also very friendly, like they stopped their car and waited patiently when I stood on the middle of the road to shoot a photograph. Try that in Amsterdam ... Kampen has put a lot of effort in restoring old buildings and wall paintings making for great photo opportunities! All images Fujifilm X100. 1. 2. This wall art by 13HOOG was commissioned by NS/Dutch Railway and the city of Amersfoort (Holland). It's located at the site where the NS/Dutch Railway used to have their maintenance and repair facilities. A series of images I shot in my hometown Amersfoort with a Fuji X100 plus WCL-X100 28mm wide-angle converter. All images shot in Astia Jpeg / Auto Dynamic Range (works amazing), postprocessing in Lightroom.